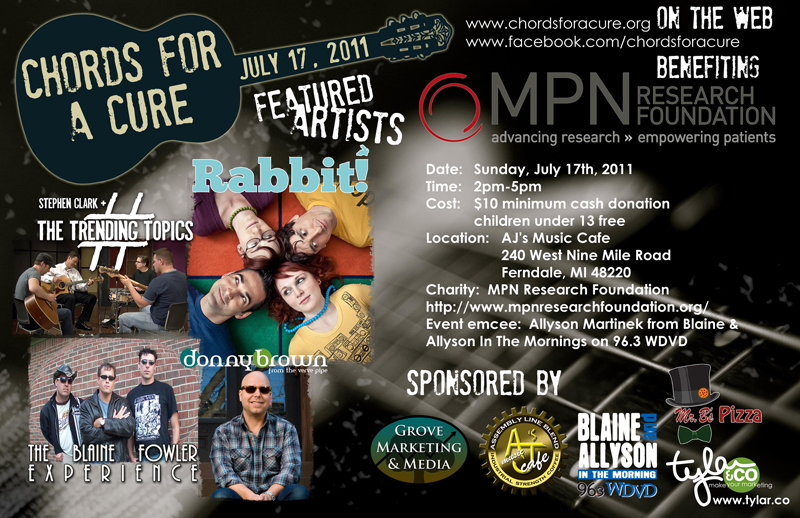 I wanted to let you all here know about a very special charity concert that my wife & I are organizing called Chords For A Cure this coming Sunday, July 17th at AJ’s Music Cafe in Ferndale, MI at 2pm. This event is to raise money for the MPN Research Foundation which supports research and awareness for rare blood cancers.. You may already know that one of these cancers has touched our life, as Jenny was diagnosed with one of them last year. This is why we feel compelled to do something to help bring us one step closer to a cure. Chords For A Cure will feature music from: Rabbit! (Ashton Allen’s new band), Stephen Clark & The Trending Topics, Blaine Fowler Experience, and Donny Brown of The Verve Pipe. We’ve got the full event details at our website: www.chordsforacure.org Hope to see everyone Sunday!